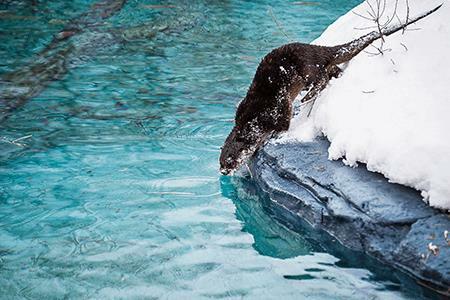 ​The Ecomuseum Zoo is home to the most impressive ambassadors of Quebec’s wildlife. All residents of the Ecomuseum Zoo are there for a special reason: orphaned, injured or born under professional human care, each of them could not return to the wild. Hence, they have found a forever home at the zoo. The $1.4 million 6,000 square foot river otter habitat, first of its kind in Canada, is made up of vast land, river banks and a 250,000 litre (66,000 gallon) water basin; includes two port holes, an underwater tunnel and a 15 meter (50 foot) viewing window. In order to improve water clarity, a high efficiency submicron performance filtration system was required to fit in a 3 meter by 4 meter (10 foot by 14 foot) mechanical room. With the need to ﬁlter contaminants and fine particles, engineering consultants had specified Vortisand® cross-flow filtration technology as the go to side stream ﬁltration system. ​The footprint of the mechanical room presented itself as one of the first challenges the Ecomuseum Zoo was faced with. With only a portion of the mechanical room space being dedicated to the water filtration system, the Vortisand team of application engineers were mandated to design a customized configuration. The natural outdoor environment of the habitat posed a second challenge for the Ecomuseum Zoo and engineering consultants. Over time the water basin acts as an air scrubber, absorbing airborne contaminants and debris as they brush along the surface of the water. These contaminants can buildup and create a film on various types of hard surfaces, potentially covering the viewing window and other surfaces found within the otter habitat. The airborne contaminants and debris also increase the risk of experiencing higher levels of water turbidity. Such high levels of turbidity will result in reduced water clarity, further limiting the learning experience for Ecomuseum Zoo visitors. Routine water basin cleaning would be costly, and the use of harmful chemicals are prohibited; ultimately requiring the removal of the fine particles before they have the chance of creating a concern. The Vortisand system was required to handle various types of contaminants and fine particulates, while yielding minimal maintenance and operational related costs. ​Thanks to its compact design, the Vortisand H2F® system was installed within the current parameters of the maintenance room. Its submicron filtration performance and high efficiency capabilities helped remove the fine particles that would otherwise make it impossible for visitors to see the otters through the viewing glass, portholes and underwater tunnel. Most importantly, the Vortisand® system made it possible for the otters to go about their daily activities comfortably. With minimal maintenance and manual intervention required, the Ecomuseum Zoo employees were able to focus on nurturing and growing their family. Upon start up a particle analysis test was conducted, showing that particles of 5 micron and less in size made up the vast majority of the particles within the otter water basin. The Vortisand system delivered 94% removal of particles less than 5 micron in size.